Every water molecule (H 2 O) consists of one atom of oxygen and two atoms of hydrogen, as shown below. Each hydrogen atom is attached to the oxygen atom by a covalent bond in which the hydrogen atom shares an electron with the oxygen atom. The shared electron is slightly closer to the oxygen atom than to the hydrogen atom. A water molecule has no net charge because the number of positively charged protons equals the number of negatively charged electrons. However, because the hydrogen ends of the molecule have a slight positive charge and the oxygen end has a slight negative charge, it is called a polar molecule. The negative and positive ends of different water molecules slightly attract each other, forming hydrogen bonds . These hydrogen bonds are about twenty times weaker than the covalent bonds between hydrogen and oxygen. The polar nature of the water molecule and the hydrogen bonds are responsible for many of water's unique physical and chemical properties. Most natural waters contain dissolved ions (atoms or molecules possessing a charge) derived from the water's interaction with soil, bedrock, atmosphere, and biosphere. As a result of these ions, water is able to conduct electricity much better than it otherwise can: for example, sea water—with its dissolved salts—can conduct electricity about 100 times more readily than distilled water. In any case, the ability of water to conduct electricity is the reason for the warning labels that appear on most electrical appliances warning consumers not to operate them near water. The electrical conductivity (or specific conductance) of water depends on the concentration and charge of the dissolved ions. Because of this relationship, conductivity often is used as an indicator of the total dissolved solids (TDS) in the water. The TDS is an important chemical property of water that provides information regarding the water's history of "evolution" (for instance, its movement through underground aquifers). Conductivity is only an estimate of TDS, however, because a given value of conductivity can be produced by several different combinations of ion concentration and charge. The mutual attraction of water molecules allows water to form thin and continuous films and also creates surface tension. At the surface of water, the molecules grab on to each other even more tightly because there are no molecules pulling on them from the air above. As the molecules on the surface stick together, they form an invisible "skin" called surface tension. For instance, pond skaters (sometimes also called water striders), along with other similar insects, can walk on the water without sinking because the surface tension of the water is strong enough to hold them. The feet of the insects actually make tiny dents in the surface tension—but not enough to break the tension—allowing them to stride or skate across the water. The movement of groundwater upward or downward due to surface tension is called capillary action (or capillarity). Capillary action generally moves water from areas with abundant water to other areas that have experienced losses of water content. In addition to their mutual attraction, water molecules also can be attracted to surfaces of minerals in soils and rocks. This attraction allows dissolving (dissolution) and other chemical reactions to occur so readily that water often is called the "universal solvent." Because water can dissolve and carry a wide range of chemicals, minerals, and nutrients, it plays an essential role in almost all biological and geochemical processes. One important chemical property of natural water that affects its ability to dissolve minerals and influence chemical reactions is its pH. The pH, which indicates the acidity of water, measures the abundance of positively charged hydrogen ions (H + ), and is defined numerically as the negative logarithm of the concentration of H + ions. Because pH is measured on a logarithmic scale, the concentration of H+ ions is ten times greater in water with a pH of 5 than water with a pH of 6, for example. Water with a pH greater than 0 and less than 7 is termed acidic; a pH equaling 7 is neutral at temperatures at the Earth's surface; and a pH between 7 and 14 is termed alkaline (or basic). Distilled water is considered neutral, and has a pH of 7. Natural waters also can be neutral, but more often are either slightly acidic or slightly basic. Water in some volcanic caldera lakes can be very acidic, with pH values sometimes less than 1. If a wristwatch were dropped into water this acidic, the watch would be damaged beyond recognition within minutes. Rain in unpolluted areas has a pH of about 5.6 due to the dissolution of carbon dioxide in the atmosphere. This slightly acidic nature enhances rain-water's dissolving power. In some locations, rainwater's acidity is greatly increased (the pH is lowered) by the absorption of certain atmospheric pollutants, causing what is called acid rain. Rainwater is neutralized by chemical reactions with minerals in soils and rocks so that the pH of most streams and lakes is between about 6.5 and 8.5. Aquatic organisms often are very sensitive to the pH of water. Below a pH of about 5, most fish will die. Water can exist in three distinct states: water (liquid), steam (gas), and ice (solid). At sea level, ice melts (solid changes to a liquid) at 0°C (32°F) and boils (liquid changes to a gas) at 100°C (212°F). The temperature at which water changes from one state to another depends on atmospheric pressure. At the elevation of Denver, Colorado, where air pressure is about 17 percent lower than at sea level, water boils at about 94°C (201°F). 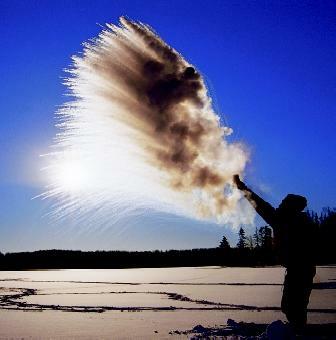 Boiling hot water thrown from a cup into very cold air will almost instantly freeze in midair and create a shower of ice crystals, as demonstrated here in northern Minnesota. See the sidebar on page 103 for an explanation. At sufficiently high pressures and temperatures, water and steam are no longer distinct phases, and instead comprise a supercritical fluid . The critical temperature is 374°C (705°F) and the critical pressure is 22.06 mega-pascals (3,198.70 pounds-force per square inch), or the pressure reached at a depth of 2.2 kilometers (1.4 miles) in the ocean. At those depths, of course, sea water is well below critical temperature. The hot water circulating in vents above the active volcanic system at mid-ocean ridges at the bottom of the ocean is thus a supercritical fluid. Water is unique among common substances in that its density decreases when it freezes; that is, water goes from 1.000 gram per cubic centimeter in liquid form to 0.915 grams per cubic centimeter in solid form. As a result, water expands about 9 percent in volume when it freezes. Consequently, ice floats on lakes and rivers, and icebergs float in the ocean. This also explains the common phrase "only the tip of the iceberg," implying that there is considerably more present than can be seen. Because of the relative densities of ice and liquid water, approximately 90 percent of the mass of ice remains hidden below water level. In water, hydrogen bonds produce clusters of water molecules with a more open (less dense) structure than water itself. Cluster formation reaches a minimum at about 4°C (39°F). Because of this, water at 4°C is more dense than water at any other temperature and will sink to the bottom in a pool or lake. In lakes, as winter air temperatures fall below freezing, this phenomenon helps to keep the lake from freezing entirely, because when the water near the surface cools to 4°C, it sinks below the crust of surface ice, which as at 0°C. As a result, water remains unfrozen at the bottom of the lake. This is the reason people with fish ponds in the northern latitudes are amazed in the spring to find their goldfish still alive even though the pond surface froze completely during the winter. When heat is added to water, its temperature increases. Specific heat is the measure of the amount of heat or energy required to raise the temperature of 1 gram of a material 1°C. The specific heat of water is 1 calorie per gram, or 4.18 joules per gram. The specific heat of water is larger than that of most other substances (about four times greater than rocks, for example). Even more heat must be added in order to melt ice and vaporize water. The amount of heat required to melt ice is called the latent heat of fusion; its value is 80 calories per gram. The latent heat of vaporization, which is the amount of energy required to convert one gram of water to one gram of vapor at a constant temperature, is even larger—about 540 calories per gram. Thus, the amount of energy required to boil or evaporate water without changing its temperature is about five times the energy it takes to warm water from its freezing to melting point. The amount of energy required to vaporize water and to melt ice is exactly matched by the energy released during the reverse of these processes. When 1 gram of water vapor condenses, it releases 540 calories; when 1 gram of water freezes, it releases 80 calories. As a result, large bodies of water such as oceans and lakes have a moderating effect on climate by storing (through evaporation) and releasing (through condensation) large amounts of energy as the temperature increases or decreases, respectively. The chemical and physical properties of water depend on the amount and composition of dissolved materials. For example, the melting point of water decreases if salt is added. For this reason, sea water can remain liquid at temperatures below 0°C (32°F), and salt is sometimes used on roads and sidewalks during the winter in order to prevent water on their surfaces from freezing. SEE ALSO Acid Rain ; Climate Moderator, Water as a ; Hot Springs and Geysers ; Hot Springs on the Ocean Floor ; Lakes: Physical Processes ; Sea Water, Physics and Chemistry of . Weast, Robert C., ed. CRC Handbook of Chemistry and Physics, 81st ed. Cleveland, OH: CRC Press, 2000. Sometimes the stream of water coming out of a faucet may produce a mild shock when touched. How can the water itself produce a shock? As people move around, particularly across carpets or the fabric on chairs and sofas, they sometimes accumulate static electricity. This is a familiar and common phenomenon: someone walking in their stockings across a carpet transfers electrons between the carpet and their body, and they then possess a net electric charge. Touching another object—such as another person or a piece of metal—discharges the static electrical charge, and a spark results. Because most tap water contains dissolved ions (charged atoms or molecules), it can conduct electricity considerably better than can pure (distilled) water. If a person touches the water while carrying the static charge, electricity can flow from their body through the water to the metal faucet, yielding a mild electric shock. The greater the dissolved mineral content of the water, the more electrically conductive it will be, and hence the more likely it is that someone will discharge their static electric charge into the water. This phenomenon is rare in most waters because of the low amount of dissolved minerals. Perspiration plays a vital role in regulating human body temperature. Without the ability to sweat, humans are much more susceptible to heat exhaustion and heat stroke. The sweating which helps to cool the human body derives its benefit from a physical property of water. It takes energy to evaporate water, so when a drop of sweat evaporates from the skin, heat energy is absorbed by the evaporating drop, leaving behind a cooler area on the skin. When many drops are evaporating across a large surface area, the amount of heat energy absorbed by the evaporation process can be substantial. A cup of boiling hot water thrown into very cold air (for example, at −37°C, or −35°F, as shown in the photograph) will almost instantly freeze in midair and create a shower of tiny ice crystals. There are several reasons behind this phenomenon. First, the near-boiling water is already close to becoming steam when it is thrown into the air, which means that the water molecules are much closer to evaporating into the vapor state than they would be if the water were cold. Second, the act of throwing the water into the air causes it to break up into tiny droplets. The water that was contained in the cup (which originally had a relatively small surface exposed to the air) now experiences a tremendous increase in the total surface area exposed to the air. This situation helps to speed up the evaporation process (evaporation is the process of turning from a liquid to a vapor). Finally, very cold air typically has a low humidity level (that is, a low amount of water vapor present). This is yet another factor aiding the transition from liquid water, to water vapor, to ice crystals. At sufficiently low temperatures, this process seems to occur almost instantaneously. i like your website. that must have taken a long time to make. good job. Excellent presentation. Tellme. why water isliquid? why H and O bonds make a liquid phase. I feltvery embarassed to reply to my son. Can you help? I left a large bottle of SmartWater in the car overnight (1.5L) in below freezing temps - around 10 degrees - and unlike a couple of other partially consumed bottles in the front seat, it was very cold but unfrozen. Liquid and clear. I decided to take it inside this morning and by the time I reached my indoor destination on the 7th floor of a building downtown I looked at the bottle and it had become opaque and slushy in large frosty-esque (scientific term) chunks. Question is, Did the water get too cold to display properties of frozen water as we know it in the other bottles because there was not air n the bottle? because there was so much of it? Did warming up actually make it "frozen" as opposed to "ultra-past-frozen? Sorry for the unscientific description but I am very curious. thanks for helping if you can. Your site has it all a hydrogeologist may need. it superb.do you have a specific chapter on recharge detailed. fascinating. Would you happen to know what temperature boiling water would freeze at if in a container such as a water bottle? Ice from saline water is generally pure exceptfor brine adhering to or occluded in the ice crystals. What happens to metals that may be dissolved in the saline water? Does they stay in the brine or do they wind up in the ice? What about oganic impurities ? do they remain in the brine?